I'd like to share few snapshots of our recently completed 2014 April Southwest China Cultural/Photographic Expedition! It was indeed another truly memorable journey, most enjoyable, gaiety, colourful, comfortable weather, flowery, full of tasty local cuisines daily... (please see one of our many meal-times during our trip: https://vimeo.com/93328219 ); joyful local cultural festivals... (see one of the local events during this trip: https://vimeo.com/93333273 ); plentiful photographic opportunities (please see few sample snapshots from this trip in the attached jpg file, best viewed in full actual pixels on your screen). ... 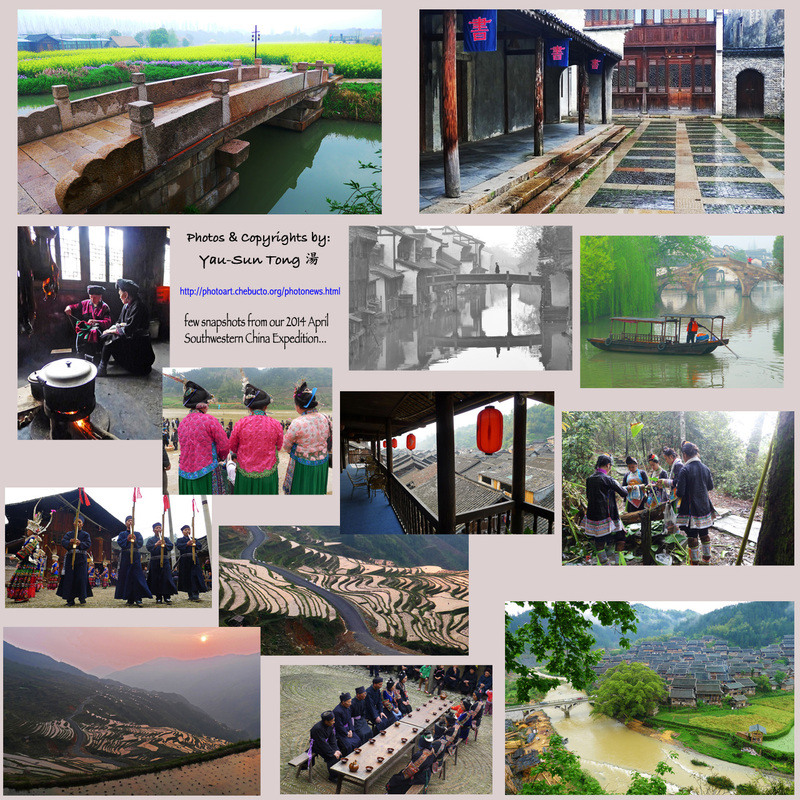 Previous to going on this journey, you did describe some of the unique cultural activities and some of beautiful scenery of Guangxi and Guizhou that we would encounter during this trip to Southwest China. I herewith acknowledge that all of my expectations and various experiences during this expedition were surpassed. The arrangements with the local tour operator, guides, tour sites, hotels, and transportation were excellent and trouble free. I truly enjoyed the friendliness and camaraderie that was developed within our small group of tourist. In particular I enjoyed our "round-table" meals of tasty and varied food, as well as the interesting and informative discussions that ensued. These all added to my learning and the cultural experience of visiting China. You all have provided us with a most interesting journey to such a vast, mysterious land with beautiful mountains, scenery, and diverse peoples. I am glad to have experienced the striking differences between the pace of life in the fast, over-populated cities and that of the serene and primitive conditions of the mountain villages. It would have been ideal to have been able to communicate directly with the people we encountered. Language barriers prevented us from doing that to a great extend; however. the gentle and sincere spirit of the local people we met during this trip, and their genuine hospitality, knows no language boundary. I thank you Yau-Sun, for organizing this worry free adventure and including me on this trip to such a foreign culture and land. This tour has provided me with too many pictures as well as many pleasant memories. Please pass on my sincere thanks to your tour organizers in China. Thank-you very much for the awesome journey to Southwest China, to see some of this spectacular country; to taste "Fresh from the Earth," local foods, and to enjoy Rice Wine; to meet the peoples of local cultures: The Yao, The Miao and The Dong; and to see how these people have lived and still live, to some degree; and to see a changing China of the 21st century and the challenges' change brings; and personally, to train Tai Chi! I was also delighted to meet some great people as part of our tour group, as well as enjoy the hard work and dedication of Mr Tong to bring about this trip with all of the amenities and activities that we enjoyed: Good hotels, an excellent driver & tour guide. We were truly well looked after! The trip for me was an eye opener. To see the endurance of a people that work hard and respect family. To see how work also blended into the environment and allows people to thrive building terraces for growing and for beauty. And to see how time has knit this huge country into a community, and that I only saw "A Fringe," I believe I started to feel its' tapestry. Matthew T. Walsh, Ft Smith, NT. I have been back in Ottawa for two weeks now and most of the urgent tasks ... have been completed. So I can now reflect on our China expedition. As a first timer in the group, I was not sure what to expect other than that participants were serious photographers. My reason for joining was seeing a part of China which many tourists don't see. I certainly was not disappointed in exploring remote villages, drifting down on the Li River in the mist/rain, watching the sun rise over the rice paddies at 1800 meters, or witnessing the shaving of a man's head with a machete. What I did not expect was the wonderful and varied dishes we would be enjoying. Some members were very knowable about Chinese food and tea. Moreover, the good camaraderie within the group made eating an even more enjoyable event. Based on my experience, I would suggest to describe the tour as "Exploring Chinese culture and cuisine"
Our young guide was enthusiastic and knowledgeable. Kudos to the driver who managed the most congested traffic and difficult road conditions flawlessly. Our Chinese tour manager looked after the logistics such hotel registration, restaurant bookings, village visits in his calm and friendly manner. Having traveled to remote places on my own, I very much appreciated the attention to details to make the journey effortless for participants. In summary, I enjoyed my adventure to Southwest China and would not hesitate to recommend your company to others who are keen to visit China off the beaten track. Your local knowledge and years of experience made the trip a success. With best wishes for the future, Gudrun Curri, Ph.D. Thank you for sending the photos -- in the midst of catching up at work and at home, what a wonderful reminder of the luxury of traveling. Having collected passports and handed out hotel keys in the past, I am appreciative of how seamlessly the expedition went, and I realize that a lot of research and backstage work took place to make our days enjoyable. Seeing very few other tourists (domestic or foreign) may give members of our group bragging rights, but less cynically, we did indeed gain experiences that do not fall into the usual tourist's routine. The healthiness of the meals we shared is at the forefront of my memories. The gathering of vegetables across the road minutes before we sat down to eat will always remain a highlight, and the plentiful vegetables, and rice in its many forms provide a sharp contrast to what faces us at home: more sugar, fats, and processed foods. Sitting together for a meal always is an enhancement, and the congeniality and special interests and talents of our fellow travelers made each meal something to look forward to. The most memorable image for me would have to be the rice terraces at Jia Ju. To have read about Yangshou and Dragon Backbone Terraces and to learn how heavily trafficked by tourists these places are now lifts the visit to Jia Ju to new heights, literally and figuratively. A simple bowl of rice will never be just that anymore. I always knew the hard life of agricultural workers, but the remoteness of some of the villages we saw and the solitary trek daily from dwellings to rice paddies underscores the gap the govt is trying to narrow between affluent town/city dwellers and the rural areas, in a way no newspaper article could. ... ... We had specific destinations, but each segment of the entire journey offered memorable views, especially since we were following rivers and had stunning views of hills and forests. It was also good to see some of China's minorities not just with their "festival" faces/costumes. Seeing them in their villages as they went about their routines, was a reminder about how many of them work on the country's farms, towns and factories and are not just showpieces for tourists. Organizing my photos will be a time consuming but enjoyable task.